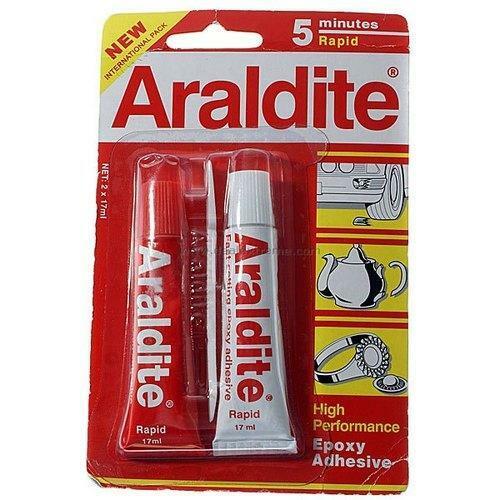 Epoxy Adhesive offeredcomprises high performance epoxy adhesives and is available under brand name Araldite in net weight of 17mlx2. As leading suppliers of Epoxy adhesives in Tamil Nadu, these have high demand in the market because of its ultimate strength and perfect bonding properties. Based on advanced two part epoxy technology, these provide for rigid and lasting bonding support for variety of surfaces as well as are also suitable for gap filling purposes. Some of its features include strong, solvent-free adhesives; providing for durable bonding and repair support; provide bonding support over metal, wood, ceramics, dry concrete, leather and other products; high temperature resistance.